Annalee Doll Description: Open eyes, mouth expression may vary, blonde hair, gold halo, holds harp. Annalee Doll Description: Open eyes, mouth expression may vary, blonde hair, gold halo, red swirl and gold star print dress, holds gold trumpet, white wings. Larger companion is 650112. Annalee Doll Description: Open eyes, mouth expression may vary, blonde hair, gold halo, white gown and wings, holds green Christmas wreath decorated with red berries, bow and bells. Annalee Doll Description: Open eyes, open mouth, white body, gold halo, angel wings. Companions are 751008, 700808 and 700908. Facial expression may vary from photo. Annalee Doll Description: Last one. Open eyes, licking his chops - as shown, white body, gold halo, angel wings. Companions are 751008, 700808 and 700908. No paper hang tag, otherwise mint. Annalee Doll Description: Open eyes, mouth expression may vary, blonde hair with silver halo, white wings and gown, holds silver bell. Annalee Doll Description: Open eyes, mouth expression may vary, blonde hair with halo, white satin gown, white angel wings, holds sparkle coated snowflake, cloud base. Like it is up in Heaven! Absolutely adorable. Annalee Doll Description: Open eyes, mouth expression may vary, blonde hair, gold halo, on soft cloud. Annalee Doll Description: Open eyes, mouth expression may vary, blonde hair with gold halo, white wings and gown, gold belt, holds gold sparkle star. Annalee Doll Description: Open eyes, mouth expression may vary, blonde hair, gold halo, white wings, white diaper, holds gold harp. Annalee Doll Description: Last one. Open eyes, open mouth, blonde hair, silver halo, white angel wings. Holds onto a 7" diameter yellow felt star with closed eyes, open mouth. Annalee Doll Description: Last one. Closed eyes, open mouth - as shown, blonde hair, white angel wings. Holds onto a 7" diameter yellow felt star with closed eyes. Annalee Doll Description: Last one. Closed eyes, closed mouth, blonde hair, gold halo, white angel wings. Holds onto a 7" diameter yellow felt star with closed eyes. Annalee Doll Description: Blonde hair, open eyes, open mouth, gold halo, white angel wings, holds harp. Annalee Doll Description: Last one. Blonde hair, open eyes, ooh mouth, gold halo, white angel wings, holds harp. Annalee Doll Description: Last one. Blonde hair, open eyes, closed mouth, gold halo, white angel wings, holds harp. Annalee Doll Description: Closed eyes, open mouth, blonde hair, gold halo, white angel wings, holds harp. Annalee Doll Description: Last one. Closed eyes, closed mouth, blonde hair, gold halo, white angel wings, holds violin or guitar. Annalee Doll Description: Last one. Closed eyes, closed mouth, blonde hair, gold halo, white angel wings. Sits on hard round cloud. Annalee Doll Description: Last one. Open eyes, ooh mouth, gold halo, white angel wings. Note: facial expression different than photo. Annalee Doll Description: Last one. Open eyes, closed mouth, blonde hair, gold halo, white angel wings. Annalee Doll Description: Closed eyes, open mouth, blonder hair, gold halo, white angel wings. Annalee Doll Description: Open eyes, open mouth, white body and wings, iridescent halo. Annalee Doll Description: Squinting eyes, closed mouth, white body and wings, iridescent halo. Annalee Doll Description: Last one. Open eyes, closed mouth as shown, blonde hair, silver halo, white felt and feather wings accented with pearls, white gown with silver trim and accented wtih jewels. This doll came from Annalee Design and was never put into production - one of a kind! Annalee Doll Description: Wanted to Buy. Blonde hair, black eye, gold halo, white angel wings. Wears white gown with a red/ green patch on it, holds a slingshot and a yellow wooden star. Annalee Doll Description: 3" high by 7" wide, blonde hair, open eyes, open mouth, gold halo, white angel wings, white and gold bow. Annalee Doll Description: Last one. 3" high by 7" wide, blonde hair, open eyes, closed mouth, gold halo, white angel wings, white and gold bow. Annalee Doll Description: 3" high by 7" wide, blonde hair, closed eyes, mouth expression may vary, gold halo, white angel wings, white and gold bow. Annalee Doll Description: Open eyes, open mouth, brown hair with gold sparkles, white sparkly wings, white diaper, gold halo, holds a green wreath with red berries around body. Annalee Doll Description: Last one. Open eyes, open mouth, blonde hair, gold halo, white angel wings. Holds holly with red berries. On a removable white snow base. Annalee Doll Description: Last one. Open eyes, ooh mouth, gold halo, white angel wings. Holds holly with red berries. Inside of card reads: "This card brings good cheer to all from far and near. Take me off and pin me on and you will see how happier you will be, Says Annalee and Me!" Can be used as an ornament or worn as a pin. An Annalee Gift Ship Exclusive, not many were produced. Annalee Doll Description: Blonde hair, open eyes, closed mouth, gold halo, white angel wings. Holds holly with red berries. On a removable white snow base. Annalee Doll Description: Blonde hair, closed eyes, open mouth, gold halo, white angel wings. Holds holly with red berries. On a removable white snow base. Annalee Doll Description: Last one. Open eyes, bewlidered mouth, blonde hair, gold halo, white angel wings. Sits on soft round cloud. 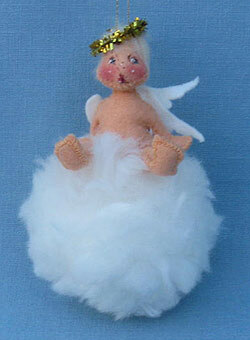 This came from Annalee design and I do not think this face was ever put into production for this 3" Angel ornament. Rare. Annalee Doll Description: Last one. Open eyes, ooh mouth, blonde hair, gold halo, white angel wings. Sits on soft round cloud. Annalee Doll Description: Last one. Open eyes, ooh mouth, blonde hair, gold halo, white angel wings. Sits on soft round cloud. Annalee seam tag has been cut off, otherwise mint. Annalee Doll Description: Open eyes, closed mouth smile, blonde hair, gold halo, white angel wings. Sits or stands on soft round cloud. Annalee Doll Description: Open eyes, closed mouth smile, blonde hair, gold halo, white angel wings. Sits on soft round cloud. Annalee seam tag has been cut, otherwise mint. Annalee Doll Description: Blonde hair, closed eyes, open mouth, gold halo, white angel wings. Sits on soft round cloud. Annalee Doll Description: Closed eyes, closed mouth, blonde hair, gold halo, white angel wings. Sits on soft cloud. Annalee Doll Description: Last one. Closed eyes, closed mouth, blonde hair, gold halo, white angel wings. Sits on soft cloud. Annalee seam tag has been cut, otherwise mint. Annalee Doll Description: Open eyes, blonde hair, gold and silver halo, white wings, holds french horn, sits on cloud. Mouth expression may vary. Annalee Doll Description: Open eyes, open mouth, white mouse head with angel wings, gold halo, red bow with gold bells. Annalee Doll Description: Open eyes, closed mouth, white mouse head with angel wings, gold halo, red bow with gold bells. Annalee Doll Description: Squinting, closed mouth, white mouse head with angel wings, gold halo, red bow with gold bells. Annalee Doll Description: Last one. Squinting, closed mouth with tooth as shown, brown body, blonde hair, ivory gown, pink wings, holds pink tooth fairy bag. This doll came from Annalee Design and was never put into production - one of a kind! Annalee Doll Description: Last one. Open eyes, open mouth - as shown, blonde hair in a bun, pink dress and shoes, wings accented in gold. Macy's Storybook Collection. Other companions to the Peter Pan Series are 943504, 943704, 943804 and 943904. See the fairy that was custom made for Sue Coffee that can be used as Tinkerbell - item 232910fairy.